After much fanfare, Razer has begun steadily releasing hardware in its high-end gaming peripherals line. The latest is some sort of 2.1 sound system called the Mako. The THX-certified system uses two satellite speakers, a subwoofer, and a wonky little remote control that hangs out like a gaming lolly. Will it improve your in-game audio? 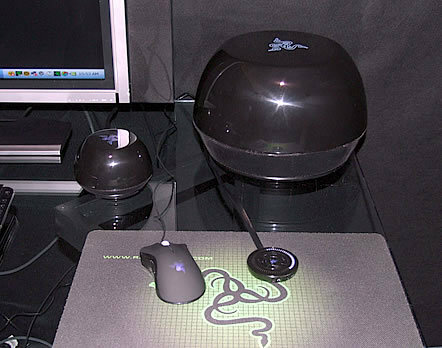 The one shown at CES was just a mock-up, but if Razer’s other gear is any indication you might be in luck. Also look for Razer’s AC-1 sound card, Taranula keyboard, some sort of blue LED BattleLight, and Death Adder gaming mouse with Black Adder beard and mustache.